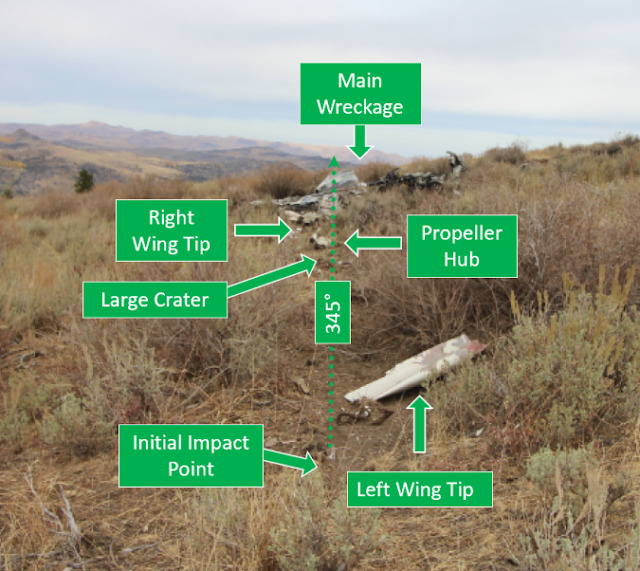 On September 30, 2018, about 0837 mountain daylight time, a Cessna T210M airplane, N732MV, collided with terrain approximately 4.5 miles northwest of Silver City, Idaho. The private pilot and two passengers were fatally injured. A postimpact fire ensued, and the airplane was destroyed. 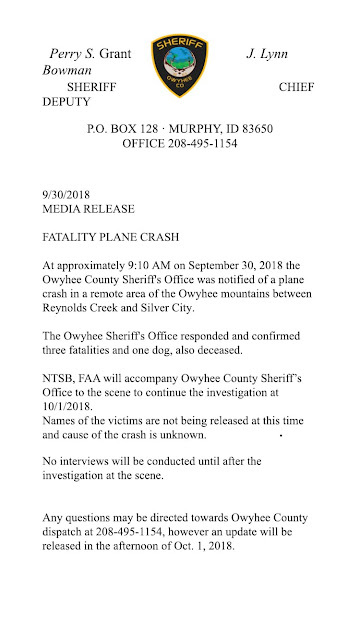 The airplane was registered to T and C Aircraft Corporation and operated by the pilot under the provisions of Title 14 Code of Federal Regulations Part 91 as a personal flight. Visual meteorological conditions prevailed at the accident site about the time of the accident and no flight plan was filed. The flight originated from Sunrise Skypark Airport (ID40), Marsing, Idaho, about 0810 and was destined for Murphy Airport (1U3), Murphy, Idaho. According to family members of the pilot, the two passengers won the flight as part of a raffle drawing. A witness located approximately 6.5 miles north of the accident reported seeing a white airplane about 0830, approximately 500 ft above the ground on a south heading. Two witness located approximately 1 mile west of the accident site, observed the accident airplane fly up a draw that runs south to north and then cross over a ridge line in a generally west to east direction. They lost sight of the airplane and soon after, observed a plume of smoke in the general vicinity. The State of Idaho Communications Center was notified at 0859 by the Air Force Rescue Coordination Center (AFRCC) of an active emergency locator transmitter (ELT) signal. The signal was detected about 0837 in the vicinity of Silver City. A friend of the accident pilot reported that he was notified by the Idaho Division of Aeronautics of the ELT signal and flew out to the search area. The pilot stated that while about 1 mile east of the accident site, at an altitude of about 6,500 ft mean sea level (msl), his onboard Garmin G3X avionics system indicated wind was from the southwest at 38 knots. Preliminary radar data provided by the FAA indicated a target traveling south about 4,875 ft msl, 6 miles north of the accident site. For 3 minutes, the target followed a track along the general path of Democrat Road and continued south up a draw. The groundspeeds and altitudes ranged between 120 and 49 knots, and 4,875 and 6,650 ft respectively. The last target was recorded about 2,000 ft west of the accident site, about 130 ft above the ground, about 49 knots. Photo 1: View of initial impact point and wreckage debris path. A plane crash Sunday morning in Owyhee County left three people and one dog dead. A company run by Tom Boyer, owner of Treasure Valley Coffee, is the registered owner of the plane, according to U.S. Federal Aviation Administration registry and Idaho business records. The victims of the crash have not been identified. T & C Aircraft Corporation — the registered owner of the Cessna T210M Turbo Centurion II aircraft that crashed "under unknown circumstances into mountainous terrain" — has Boyer listed as the sole agent and director on the company's 2017 annual report form to the Secretary of State. The 2018 annual report form from Treasure Valley Coffee lists Thomas Boyer as the owner as well as Suzanne Boyer as the secretary. 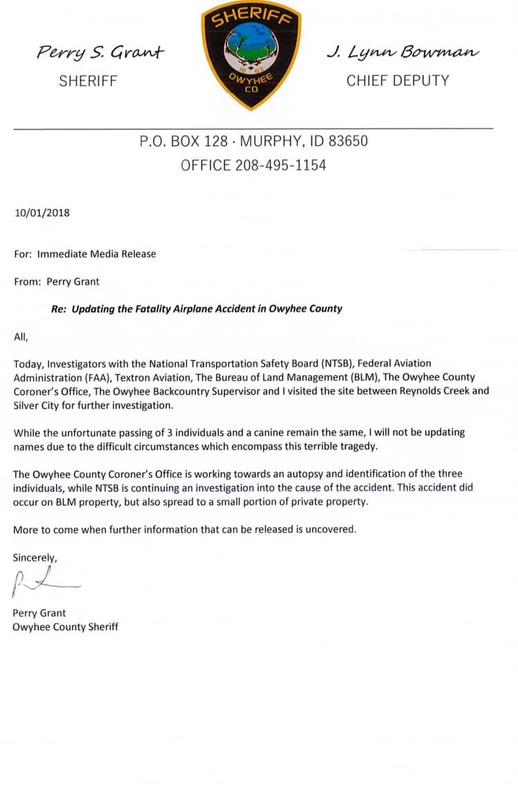 The crash occurred about 9:10 a.m. Sunday in the Owyhee Mountains between Reynolds Creek and Silver City, according to the Owyhee County Sheriff’s Office. The victims of the crash were not identified in the news release. The fatalities are listed in the Federal Aviation Administration's crash data as one member of the flight crew and two passengers. The cause of the crash is under investigation, according to the sheriff's office, which will be aided in the investigation by the National Transportation Safety Board and the Federal Aviation Administration.